The whole town is decorated and the cozy feeling is highlighted by the most beautiful Christmas lighting. The inner city, around the Square will again be filled with Christmas stalls where you can buy delicious specialties that belong to Christmas. In the inner city and in the market will also take a variety of activities for both children and adults in the period up to Christmas. Program is available at the reception. Christmas City Tønder has become a trademark of the greats. "It's in Tønder, Christmas begins," we usually say - marked with the annual Santa Claus parade in the beginning of November. 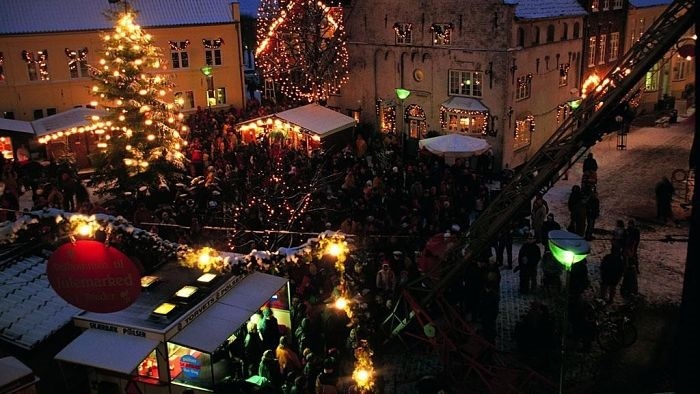 From there we go with the Christmas market, Santa Claus in the streets and flying Santa Claus on the roof. In "The Old Pharmacy" from 1671 you can explore the 1,200 m2 Christmas, Christmas and again Christmas and visit Santa's post office and get his post special stamp of Santa Claus. This year again offers Christmas City Tonder at a huge Julemandsløb >> SANTA RUN << on 19 November, where all runners will be dressed in Santa Claus outfit. Join a fun and different run with true Christmas spirit!